The Médecins Sans Frontières/Doctors without Borders (MSF) trauma surgery project near Jordan’s border with Syria opened in September 2013. Since then, the project team has conducted more than 2,000 major surgeries, many of which were life-saving , on over 600 patients. “One of our very first critical patients was admitted after he had been caught in an airstrike in southern Syria. He told our medical team ‘let me die, you can’t fix me,’” said Paul Foreman, MSF head of mission in Jordan. The patient needed major surgery and three external fixators – devices which keep bones stable until they heal. After nine months of care in hospital and more than 30 surgeries, he was discharged. “Not only did I survive, but I’m going to be able to walk out of here,” the patient told the head of mission. 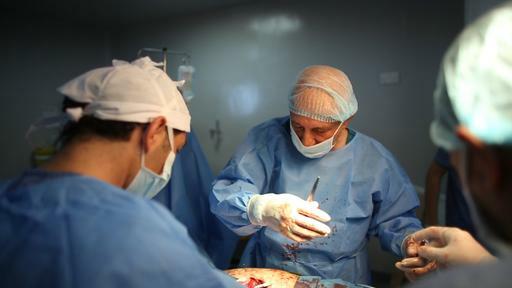 The Emergency Surgical Programme inside Al Ramtha Government Hospital, where MSF works closely with Jordan’s Ministry of Health, is around five kilometres from the Syrian border. MSF runs two operating theatres, and two in-patient and recovery rooms, and two wards – with a total of 33 beds. More than 140 national and international staff works in the project. Operations conducted at the trauma surgery centre include treating severe abdominal, chest and orthopedic injuries and in addition, physical therapy, mental health services and general inpatient care are provided. To date, a total of 1,100 mental health consultations have been carried out. Although not in the country where the conflict is taking place, MSF teams are witness to the devastating impact of the war in Syria through the extensive injuries of our patients. Despite their best efforts, the severity of some of the injuries, and the time it can take to reach the hospital, mean that not all the patients survive. An MSF surgeon treats a Syrian refugee for serious trauma injuries at Al Ramtha Hopital, Jordan. “Every single death of a patient strongly affects our team. Despite their skills, hard work and dedication, unfortunately some people can’t be saved,” said Paul Foreman, head of mission. “In the last year, 17 patients have lost their lives, meaning that the mortality rate is less than three percent,” Foreman added. As the project grew, MSF opened a post-operative care facility at the Al Zaatari refugee camp in March 2014. This 40-bed facility is for war-wounded patients transferred from Al Ramtha and other hospitals in Jordan. To date, MSF has admitted 179 patients, and as part of the post-injury treatment, more than 190 mental health consultations have taken place as well as other physical therapy services. Helping people recover physically and mentally from traumatic injuries is a key part of the project. To assist in this process, MSF invited Richard Whitehead, a British Paralympic champion to meet patients and talk about his disability. He runs with prosthetic legs, as he has a double amputation. He explained how he managed to overcome obstacles and social barriers and become a professional athlete. “Here in a conflict situation, it is very important to try and be positive and guide people through the process of getting back onto their feet, getting back to their loved ones. I hope that with somebody like me, patients can relate their circumstances to my disability and see some of the challenges that I’ve had to overcome,” said Richard Whitehead. 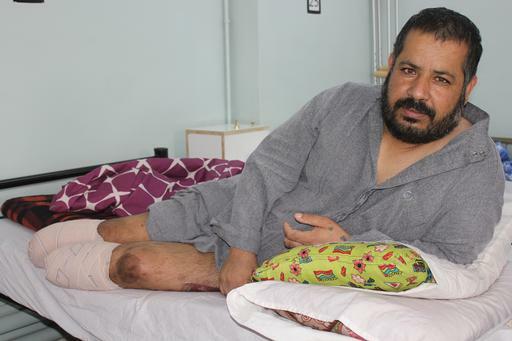 Nawaf, a 45 year-old amputee patient at an MSF clinic, "I tried on my prosthetics two days ago, I feel so happy." War-wounded patients admitted to Al Ramtha Government Hospital are not registered as refugees in Jordan. Once discharged from the hospital, some return to Syria if they don’t require further medical follow up. Other patients then go to one of the refugee camps in Jordan, including Al Zaatari in Mafraq, where MSF has the post-operative care centre. However, if they are sponsored by a Jordanian family, they are permitted to reside in a host community.